It&apos;s a Mayan&apos;s worst nightmare: The end of the world is coming. After Friday, Dec. 21, it&apos;s all over for us earthlings. Finished. Game over. Kaput. Fortunately, there&apos;s a new sanctuary in Danville, Indiana: CJ&apos;s Bar & Grill. Located at 81 N. Washington St. in Danville, a block north of the Hendricks County Courthouse Square, CJ&apos;s Bar & Grill was opened by Shaun Childs on Nov. 16. They unlock the doors every day at 11 a.m. and stay open until the wee hours of the morning. Where does the "CJ" come from in the name of a place owned by Shaun Childs? They are the initials of his kids&apos; names. You&apos;ll want to hurry in to CJ&apos;s though because according to the Mayans, on Dec. 21, CJ&apos;s -- and the rest of the world -- is going to meet an ugly, ugly fate. We&apos;re all going to be smashed to bits by an asteroid, abducted by aliens, eaten by dinosaurs, turned into New England Patriots fans or something horribly ugly like that. Just like in Y2K. So as long as we&apos;re going to meet an ugly fate, we might as well go out on our own ugly terms -- wearing our ugliest Christmas sweaters at CJ&apos;s "End of the World / Ugly Christmas Sweater Party" on Friday, Dec. 21. CJ&apos;s will be offering drink specials all day long, and starting at 10 p.m., there will be live music courtesy of Down Shift (for a sneak preview of Down Shift, click here). Prizes will be given for the ugliest sweaters, so get ugly and get down to CJ&apos;s for the end of the world. 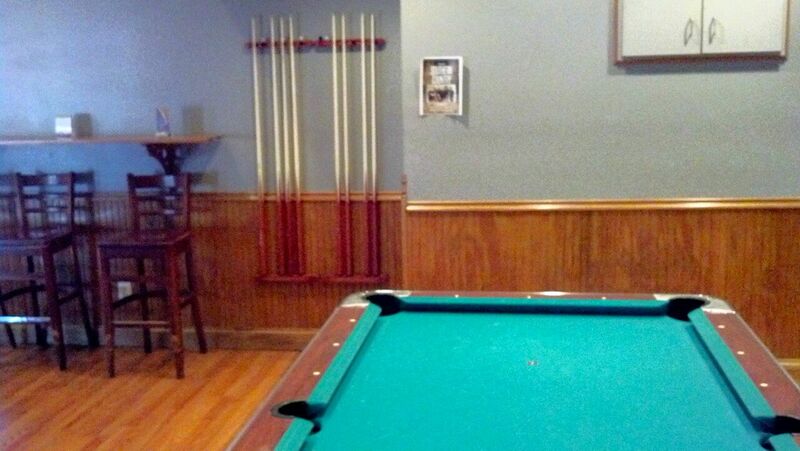 In addition to live music, CJ&apos;s offers dancing and billiards. To the delight of sports fans everywhere, CJ&apos;s also has the NFL Network, and with $1.50 domestic longnecks offered on Thursdays, it&apos;s an inexpensive way to gather with friends, relax, and watch some football. Be aware that smoking is allowed inside of CJ&apos;s Bar & Grill, so whatever your position is on that topic...now you know. Now that we&apos;ve got the "bar" part covered, how about the grill at CJ&apos;s? Is it any good? I decided to check it out for lunch, and I wasn&apos;t disappointed. 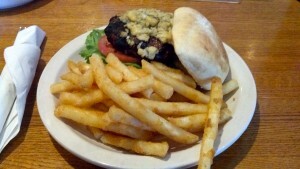 After seeing a variety of sandwiches and burgers, soups and salads on the menu, I asked my waitress what she recommended, and she was quick to tell me that the Black & Bleu Burger is her favorite. It has Cajun seasoning and is topped with bleu cheese. I&apos;m all for a spicy cheeseburger, so bring it on! My food was ready in a timely fashion -- a person with an hour-long lunch break won&apos;t have any trouble getting back to work on time -- and was piping hot. My guess is that the burger is a half-pounder, and the fries are those big thick ones with the crunchy outer coating -- my favorite kind. A large cup of Diet Coke (which includes free refills) to go with it, and I was a happy camper. The burger was fantastic. Hot, juicy, and garnished with lettuce and tomato. The Cajun seasoning had just enough pep to it to give my mouth a tingle without setting it on fire, and the bleu cheese was the perfect complement. The portion size was just right for me, and it was a delicious meal all the way around. My waitress suggested that I try the spicy jalapeno burger the next time I&apos;m in. I think I&apos;ll do that. 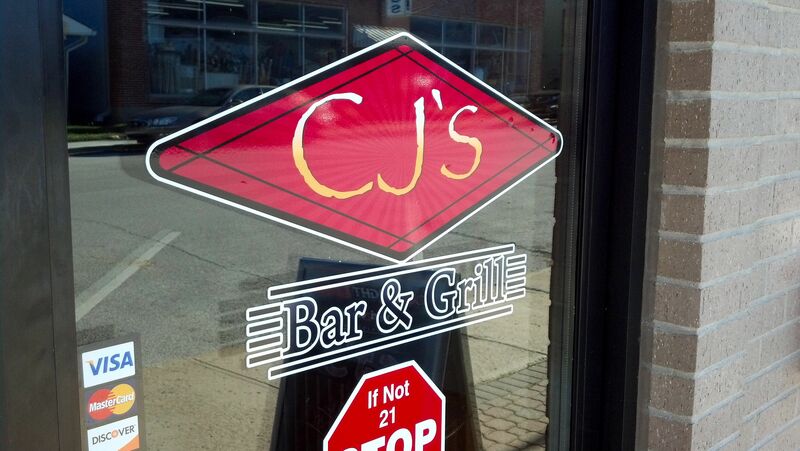 And if you&apos;re there before I am, come back and post a comment about your experience at CJ&apos;s Bar & Grill!